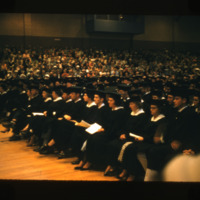 Image shows graduates assembled and seated during the 1958 Appalchian State Teachers College graduation. 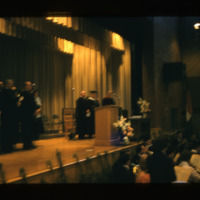 Slide has inscription that reads: ASTC Glenda's Graduation. 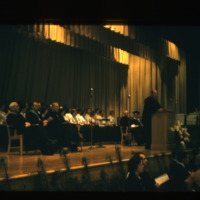 Image shows ASTC official at podium with other officials seated on stage during the 1958 Appalachian State Teachers College graduation. Inscription on slide reads: ASTC Glenda's graduation. 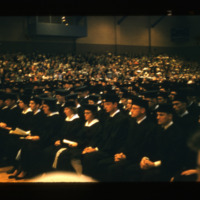 Image shows graduates assembled and seated during the 1958 Appalachian State Teachers College graduation, which appears to have taken place in a gymnasium with a stage. Inscription on slide reads: ASTC Glenda's graduation. Image shows various college official gathered on stage during the 1958 Appalachian State Teachers College graduation. 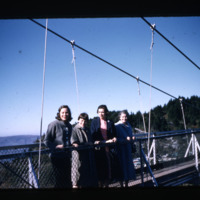 Inscription on slide reads: ASTC Glenda's graduation.